Phitz is a Chicago-based company. We do all of our instrument case design work here. We manufacture our cases at our wholly-owned sewing factory in China. We control every aspect of design and every aspect of quality, and we think that matters a lot.We care about everything. We individually inspect each case many times during the manufacturing process. We use better materials, thicker foam and tougher thread. We call out better sewing details than you'll find in other products. We use a big, beautiful, #8 self-healing nylon zipper from a great manufacturer and custom-mold our zipper pulls. We pull-test each batch to guarantee their strength. You'll never know that our stronger thread and obsessive testing kept your case from coming apart three weeks after you bought it - when the competitor's case that you're considering would have failed for lack of similar attention. The details matter. The foam in these cases is .6" thick - about as tall as a dime. It's a comfortable amount for sliding in and out of your car, carrying around town, or wearing on your back on a bicycle. It's also suitable to carry on to an airplane.We designed this to be a good case and we hope that we've succeeded. (Lots of happy reviews from customers suggest that we have.) We guarantee our cases and happily accept returns and exchanges.From all of us here, thank you for considering a Phitz case. We hope that you'll make your next case a Phitz. Almost-zero return rate - in the last twelve months, the return rate on this case was less than .2%! We're happy that customers who purchased this case are so obviously satisfied with the product that they received. The large front pocket will hold anything you need. The pocket can fit straps, picks, strings, small notebooks, and anything else you'd want to put in there. 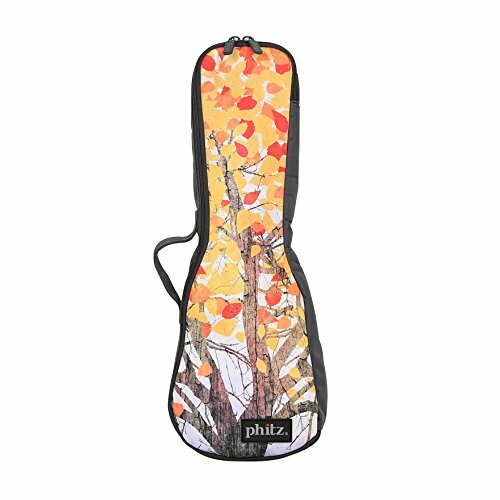 This case fits most concert ukuleles, including: Cordoba 15CM, Epiphone Les Paul Acoustic-Electric Concert Uke, Martin C1K, Fender Mino'Aka, Kala KA-C, Lanikai LU21C, Luna Mahogany Series, Mitchell MU70, Oscar Schmidt OU2/OU5. When in doubt, check the drawings that are in the images in this listing. If you have any questions about this product by Phitz, contact us by completing and submitting the form below. If you are looking for a specif part number, please include it with your message.